Stalwart Investment Advisors | Why we bought Garware-Wall Ropes? Why we bought Garware-Wall Ropes? In 2015 we got lucky when we spotted both these elements to be present in a business called ‘Garware-Wall Ropes’, a Pune based technical textile giant. Technical textiles are textile materials and products used for their technical performance and functional properties. Unlike conventional textiles used traditionally for clothing or furnishing, technical textiles are used basically on account of their specific physical and functional properties and mostly by other user industries. The market for technical textiles is expanding as the products are being put to use by an ever-increasing number of end-users in various industries such as agriculture, clothing, construction, healthcare, transportation, packaging, sports, environmental protection, protective wear, and more. These products are mainly manufactured using polymers like Polyethylene(PE), Polypropylene(PP), PVC and other varieties of polymers; which are all mainly derivatives of crude oil. Globally technical textile is $130 billion industry and forms over 50 per cent of the overall textile industry. The size of the Indian technical textile industry is estimated to be north of Rs 1,00,000 Cr. 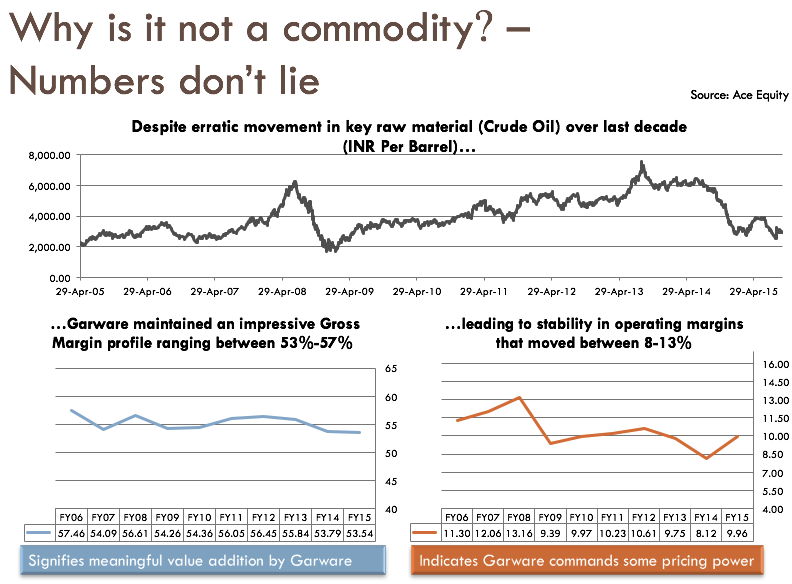 Garware though is present only in select pockets; ~10 per cent of this market i.e. the market size of Garware’s current offerings in the domestic market stand at around Rs 10,000 Cr. of which the company’s share comes at around 4 percent (Rs 400 Cr. domestic revenues). Fishing Nets: As an innovative solution provider, Garware caters to the global requirement of the various discerning users in the active and passive fishing with products of Synthetic Fishing Ropes, Twines, Nets, Fabricated Products and services of acclaimed international standards. Garware is the market leader in fisheries industry with over 60% market share in India and a dominant player in many parts of the world. India is the second largest producer of fish in the world with 5.43% share. Aquaculture: Its application focus and user centric approach has enabled Garware to offer Customized Synthetic Cages, Predator Nets and Mooring System Ropes of stringent international standards for Aquaculture that are used in marine, inland and brackish water environment. Sports Nets: Tennis, Golf, Volleyball, Soccer, & other sports, sold under ‘Sportiva’ brand. In most major global sporting events like Wimbledon and FIFA Garware Sportiva nets are used. Garware is largest sports goods exporter from India. Is it a commoditized business? Our understanding and scuttlebutt around the product & solutions provided by Garware gives us confidence on the crucial role these play for the user industries. For instance, in deep sea fishing the quality of net is one of the most crucial aspects as each trip catches fishes worth a million dollars (Rs 6.5 Cr.). Similarly, it is unlikely the purchasing manager at Wimbledon Championship is going to compromise on quality of nets or switch supplier for a lower price, given it constitutes such a tiny part of overall expense but plays a vital role i.e. cost of failure is high. Unlike a commodity where price is the single most important factor in the purchase decision, our interaction with dealers and fisherman suggest that even a small scale fisherman gives a lot of importance to quality of net i.e. abrasion resistance, water absorption, stiffness, manoeuvrability etc. All of these have a bearing on the amount of catch, speed of the boat, fuel consumption and ease of overall operation. We believe 2011 was a turning point in Garware’s history as it saw a leadership change with third generation taking charge; Vayu Garware became the managing director taking charge of the company from his father Ramesh Garware. Later Shujaul Rehman was appointed as president and chief operating officer; he brought 23 years of experience with him in various blue-chip companies. The company then adopted a new strategy which involved entering newer segments like protected farming, defense and launching newer and innovative products in existing segments. Garware has launched a product line under brand ‘PLATEENA’ which is one of the best innovation from Garware’s stable. PLATEENA, uses Dyneema® in its products which lends higher strength than steel but weighs one-seventh of steel. These ropes are easy to handle, have longer life and require no oiling or greasing and the rope can be easily spliced or repaired on board. 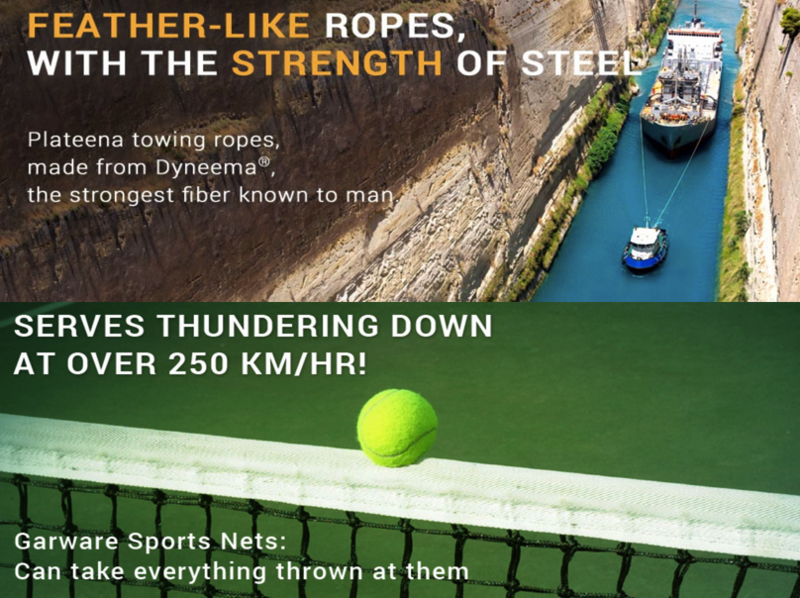 Developed and patented by a Netherland based company DSM, Dyneema has been termed as world’s strongest fibre. Garware being the only license of Dyneema in India, uses this strong fibre to manufacture fishing nets, ropes and shipping & industrial ropes. Garware has supplied ‘Plateena’ ropes to a high-surge port, where they are used on Rolls Royce automated winches for mooring of large vessels, especially in the monsoon. ‘Plateena’ ropes also find applications globally in shipping and mining. GWRL is a leading cordage manufacturing company in India that has shared a close bond with Indian fishermen for the last three decades, becoming a household name in the fishing community. The fishing industry looks to suppliers such as GWRL as the providers of new technology that help keep fishing a profitable business. Plateena rope made with Dyneema® is one of the most sought after product ranges in the international market along with the Sapphire, Maxima and Maxiflex range of products, also from GWRL. GWRL utilizes its unique network of rural homemakers in the surrounding villages around Wai for fabrication of net and rope articles. This provides home-based employment to around 1000 underprivileged families. Garware addressed a major problem faced by fishing community- attacks by predators like sharks and sea lions, which bite into valuable fish. 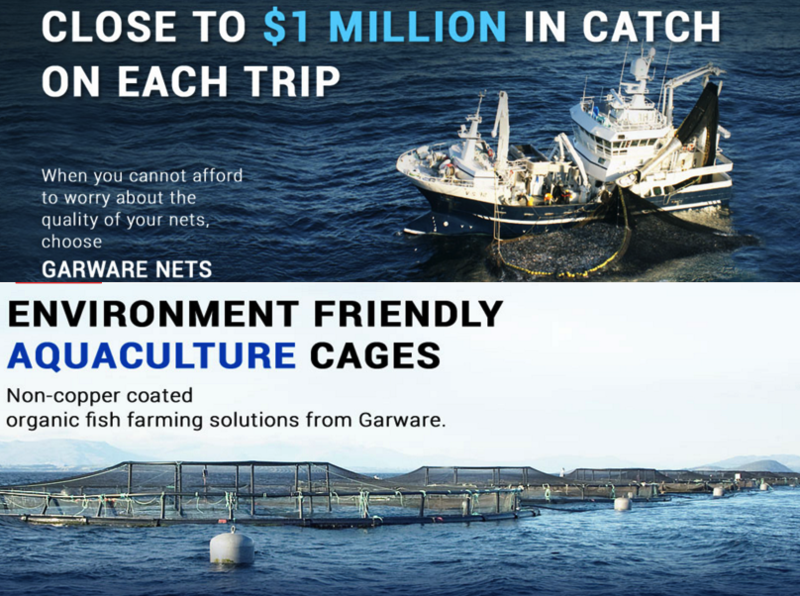 Garware has developed a unique protection net- ‘Sapphire UltraCore’, which is cut-resistant, stiff yet not rigid, easy to handle and safe to use, it will also help customers net higher returns, by saving fuel and increasing catch. It is a unique mixture of polymer and metal wires with a stiffening resin. Garware has already filed a patent on this innovative product. Nextgen net for trawling: Made from a specially engineered and patented multi-mono polyolefin yarn, ‘Garfil Star’ offers high tenacity and strength with lower weight and diameter. It helps vessel to moves faster and consumes less fuel, the net gets opened wider and more fish are caught. The net also has longer life. For the Aquaculture sector, Garware has developed pioneering solutions for customers in India and abroad which help in meeting environmental requirements and reduce their operating costs. These cages are non-copper coated and a big healthy contribution by Garware towards organic fish farming solution. This is one of the fastest growing segments along with higher margins for Garware. Majority of aquaculture sales are from the exports. One innovative product introduced recently is the ‘STAR Cage’- this product has been very well accepted in European and North American markets. Garware uses Dyneema in this segment too. Important brands for Garware in aquaculture are – Plateena, Sapphire & X2. GWL indigenously developed ‘Special Polyolefin Fibres (SPF)’ for STAR range of Cages. Garware has recently entered into defense sector in order to explore the emerging opportunities that the hitherto protected sector is offering now. Garware has collaborated with Defense Research and Development Organization (DRDO) and is developing a slew of import-substitute products such as inflated structures for radars, flexi helipads (filed patent), aerostat balloons, camouflage nets for military and high performance cordage. The opportunity size is Rs 1,800 Cr. for the products being developed by Garware. Management expects Garware to generate a turnover in excess of Rs 100 Cr. from defense segment in next 3-4 years. We see a big opportunity in the recently entered area of Agro-tech; Protected Cultivation. Currently, only 1 per cent of India’s agricultural acreage is under protected cultivation against over 70 per cent in countries like Israel and over 50 per cent in many developed nations. Since the overall acreage is unlikely to see any growth, Indian agriculture sector would have no option but to use new age farming practices to increase yield and meet the growing need of the population. 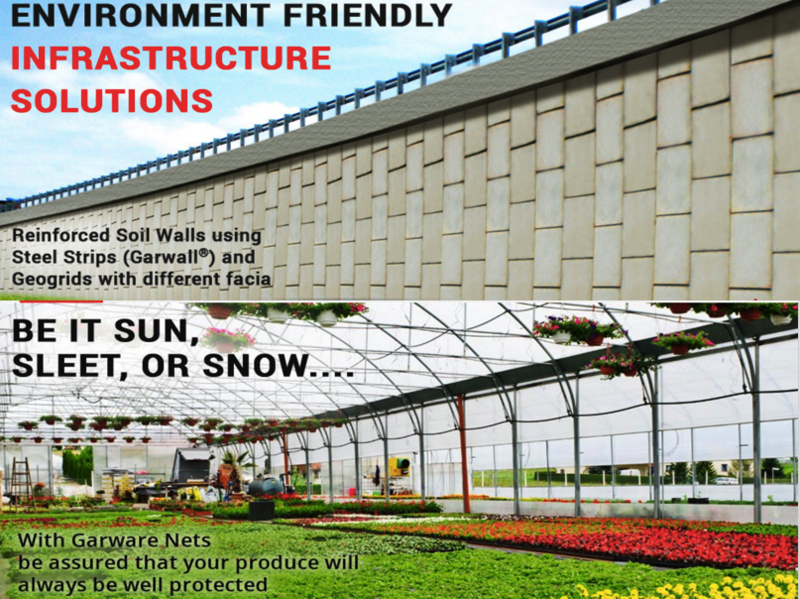 In the process, Garware nets also serve an important environmental goal; it prevents or reduces use of chemical insecticides & pesticides which also makes it a fantastic proxy on rising preference towards organic foods. While cultivation of fruits and vegetables in protected environments is well-established, other application areas for technical textiles, like sericulture and floriculture, are gaining recognition. Garware brands command a premium over other competing brands, generally ranging between 20-25%. It was encouraging to see the brand recognition; a dealer indicated that for certain product categories like Garware HDPE Nets sometimes there is even a waiting period. Fishing Nets have a life span of 6-12 months based on the product type. Only a few type of nets can be repaired and most others have to be replaced in case of any damage. This implies these are consumables rather than capital goods and fisherman have to keep buying every now and then. Competitors include unlisted players like Mumbai based Tufropes in synthetic ropes and nets, Goa-based Menezes in Fishing Nets, Oceansafety ropes by Axiom Cordage and some international players like Netherland based Lankhorst Ropes. The strength of the underlying business to generate high margins, return on capital employed and cash flows should ultimately be reflected in the Balance Sheet. Garware enjoys a debt-free balance sheet and in fact, holds ~Rs 100 Cr. net cash. 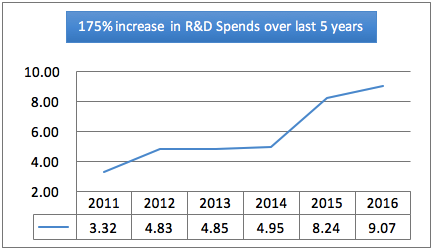 With no big bang capital expenditure planned over next few years, we expect Garware to generate healthy free cash. Since listing in 1978, the company diluted equity only once in 1996 when it had a rights issue. 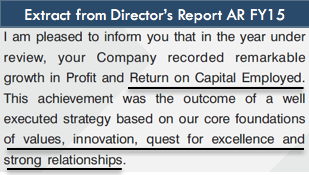 Since then the company has never raised money via equity route, in fact, it bought back ~18 lac shares (~8% of outstanding shares) between Sep’13-Jun’14 taking advantage of depressed stock price, which indicates smart capital allocation skills. In its 39-years of existence as a listed company, it has never skipped dividends. When we initiated coverage on this business, the stock was available at Rs 373 (market cap of Rs 816 Cr.). During the onslaught of Jan-Feb 2016, we added aggressively bringing down our average purchase price to Rs 342. It was then available at a trailing earning multiple of 15 and we sensed good potential for at least ~20% earnings CAGR along with scope for re-rating. Market leader in profitable and expanding niche. Focussed on customers and solutions, foray into categories like Defence & Protected Cultivation to drive growth. Owner-Operated (promoter family owns 51% stake). Debt-free & cash-rich balance sheet & fantastic capital allocation. Negligible institutional holding & boring business (classic Peter Lynch type stock). PPS (June 2017): When we shared this blog post, Garware-Wall was on our ‘Hold List’ and we never recommended a buy/add at that price citing rich valuations. Two weeks later FY17 annual report was released. There were some large unexplained balance sheet items which made us a bit uncomfortable given it was one of our largest positions in the model portfolio. An exit note was hence shared explaining our rationale and can be accessed for free on Guest Dashboard. Disclaimer: This is not a recommendation to Buy. Read complete disclaimer here. I’m very very impressed the model of approach…. Now hat you have exited the stock, is it possible to share your initiation report and follow ups so that people can use i as a reference on how to research stocks? I am astonished after reading your Synopsis on Garware Wall Ropes Ltd. I never thought that ropes will be find in many useful applications across diverse sectors. Its foray into technical textiles, niche segments, future prospects is wonderful. I have never read such a research analysis like yours. All the best for your team members. I hope and trust your valuable service is available for small investors like me at a lower fee.